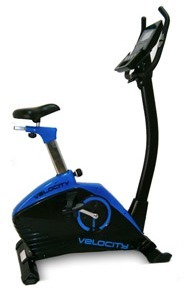 The TruPace V320 exercise bike comes with an impressive array of features for a lightweight budget machine. It is a convenient and cheap way to get the cardio exercise you need on a daily basis. The window display is a dual-color backlit LCD readout that shows time, speed, distance, watt, calories, and pulse rate. The attractive console has picture profiles of the 12 pre-set programs. UPDATE: TruPace is out of business. 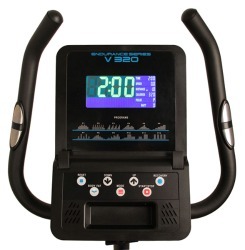 Check out Horizon and Schwinn for comparable exercise bikes to choose from. 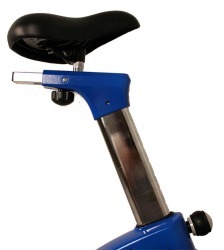 The TruPace V320 exercise bike offers a wide cushioned seat with fore/aft adjustment for maximum comfort and support. 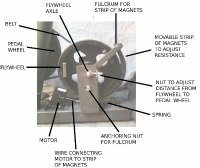 It offers a range of resistance levels to make pedaling easier or more difficult, and a smooth, fluid flywheel. The TruSound system has an iPod or MP3 plug-in port, built-in speakers, and an audio jack for headphones. The handlebars feature a set of handgrip heart rate monitors to help keep you in the training zone while exercising. Programs include manual, watt, custom, 3 goal (time, distance, calories), 4 heart rate control, and 12 programs with 8 levels each. The 90-day warranty on wear parts is short so consider buying an extended warranty of one to four years, which you can do at check-out when you purchase a TruPace V320 online. Standard curbside delivery is included free and that is your best option for this 70-lb exercise bike; however, you can opt for in-room delivery for an additional $80. 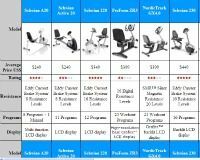 The upright TruPace V320 exercise bike compares favorable to what NordicTrack, Schwinn, and Stamina are building at this price. The TruPace at $299 is typically $60 to $90 less than what the others cost, although once you purchase an extended warranty the price becomes equal to everything else. The bike debuted in 2011 so it is hard to estimate what the durability will be, but if you don’t want to spend a lot of money on an upright, this one seem to be a decent bet.